Discounted Bird & Parrot Cages - FREE SHIPPING!! Let your bird enjoy a fresh, clean, white cage liner every day! Put a whole week's supply of these veterinarian-recommended waxed paper liners in your bird's cage bottom, and simply remove one each day for a fresh cage. Cage Liners are available in a variety of sizes to fit most cages. 60 count. Available in several pre-cut sizes. 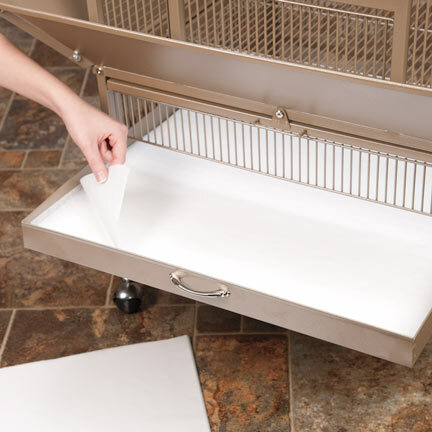 You can determine the size you need simply by measuring the inside dimensions of your cage tray. You want to find the closest fit without too much overlap. Help keeping seed and other debris from falling out of cage. Has elastic and its stopper at top and bottom of the guard to snuggly fit any cages up to 62" circumference. Has elastic and its stopper at top and bottom of the guard to snuggly fit any cages up to 72" circumference. Stuff with treats, toys or veggies. Great for foraging!